Two weeks today until the big one. Forget your gift shopping list for a minute. It’s time to implement Outfit Planning Mode (OPM). Awesome. Maybe share your outfit in the comments below. Still looking for a starting point? 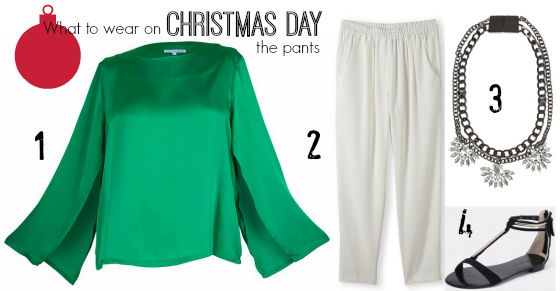 This post just might help you get on track for what to wear Christmas Day? I’ve covered off on the beauty side of things, now I’m talking keeping your cool and looking fabulous in an outfit that will serve you well on the day and beyond. Now, you may not be of the same festive school of outfit thought but I do like to embrace the colours of the season. It’s by no means essential. I’ve kept the below suggestions on the casual side as most questions in this Facebook post concerned dressing for a casual Christmas Day. And I know for some of you it will be a day spent in your swimsuit, with a cover-up thrown over for lunch. I will be doing something similar – if the weather behaves and delivers us a great Sunshine Coast beach day for our last Christmas here. I’ve also kept the outfits simple – and flowy. It’s a personal preference when the champagne and food will be flowing in plentiful amounts … and on a day when the lounge will be calling out for a little post-Christmas lunch nana nap. Never underestimate the casual elegance of a maxi dress. This one does have a lot of fabric so may be worth buying down a size if it still fits up top. You could also belt this dress if your torso is a lovely long one and benefits from a little waist cinching. Don’t let the thin straps scare you. Wear a slip or seamless tank underneath and wear a normal bra. This is the quintessential Christmas frock. A beautiful red in a design that is flattering and wearable. Want to dress this up even more? Opt for blinged accessories and sparkle the whole day through. Not hot and humid where you celebrate Christmas? Get on board this combination. It’s still says summer and Christmas but in an elegant pants statement. You could also swap out the pants for shorts. Love this top’s long sleeves with slits – for ventilation with flattery. And the colour is just gorgeous. Tell me … what are your Christmas Day plans and what are you thinking of wearing? 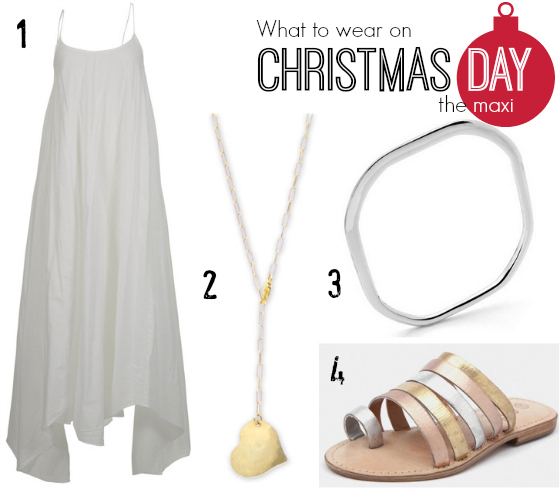 I love the idea of a maxi on Christmas day, but with three small people I doubt I’ll be wearing white! Fabulous flat sandals and plenty of bling are definitely the way to go! I’ve never been afraid of white … always have NapiSan on hand! Bling is always a good idea. I’m hoping for a hot(ish) day to wear my new multi-coloured (pinks, oranges, yellows) maxi-dress from Witchery. Figure belted for the day, then potentially unbelted in the evening (after all that Christmas lunch & pudding!!!). Paired with my Ecco raspberry coloured heeled sandals. Festive, but not too much is the look I’m going for! Oh that sounds fabulous Rebecca and the unbelt plan is a good one! Could I please ask what program you use to display items on. Love how it looks? I use a combination of Snagit and Picmonkey, Michelle – and thanks! Love the white ensemble. My outfits already chosen for Christmas. It’s a leopard print Valentino Red dress, and I am in love!!! I gave up coke zero as a compromise to getting this dress- am making financial amends with cola zero for the soda stream instead. We’ll be in Toowoomba- probably eating seafood poolside. You are very financially astute Housewife in Heels! Love the sound of the dress and enjoy your Christmas. Hope to meet up in the New Year! We’re having Christmas at home this year, in Brisbane. My very fave place to be on Christmas Day :). It will be hot. I will be cooking. Need to wear something cool. I’m taking next week off work to get myself sorted for Christmas and outfit planning is on the list! Thanks for these great suggestions to get me thinking. Oh yes, it will be hot! That’s why I always insist on salads. It doesn’t go down well with my traditional husband who grew up in the UK! Lunch at my Dad’s place (which I have to cook!) so it is nice and casual. At this stage it is the CR chambray pants and I am just working on a top for them. I am trying very hard Nikki not to copy your entire outfit but it could well end up that way!! Oh Kelly those pants will accommodate a Christmas feast! And copy away!! 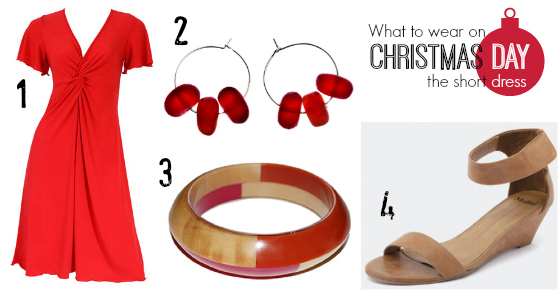 I’m definitely a red gal – just LOVE that Verily dress (Christmas present to self, perhaps!). Our day is always casual with a small family gathering. This year it’s at our house so I’ll need to be comfy and cool – stylish will be a bonus! Self-gifting is always a good idea Carolyn! Christmas in Brisbane, so it’s the Sacha Drake Maddison dress for me, in bright red! Lovely maxi length and strapless for the inevitable heat. Oh I have the halter version of that dress in red … haven’t worn it yet this year. Might need to change that! Im going to Denmark for Christmas and having a cold winter indoors all day will be a new experience for me. Im struggling with what to wear as it needs to be festive, but also warm. HELP! Anne, the heating inside will still make it ok to wear something festive – not a sun frock but a light knit, jeans and accessories! Boy that model must be tall, I’m 169cm and that dress is just above my knee! Oh that dress is just gorgeous Johanne – and yes a lesson in different heights and hem lengths! She’s probably a good 10 or so cm taller than you! Love these suggestions, and you are so right, it’s all about being cool and comfortable but stylish too – because I intend to eat a lot and not beat myself up about it! Me neither Jo! The packing starts the next day so will burn it all off!! Yes I think that dress would be a better colour for you Mindy – and that’s beautiful that you’re taking another family under your wing for Christmas! 2 weeks! Shhh, don’t remind me! Uh, I haven’t even got all my Christmas shopping done. I have NO idea what I’ll be wearing, i’m so un-organised this year. Christmas for me is spent having a family lunch, plus this will be the first time my boyfriend ‘meets the parents’. I never think about what I will wear ( I’m all about the food!) but now I want that white dress & sivlever & gold sandals! its a three outfit day! supercool speedo Havana print one piece with navy short shorts, red vintage sunhat and white havianas for morning beach trip. White whayne Cooper broderie anglaise baby doll dress with silver slides and Alannah Hill sparkly headband for lunch and then Zimmerman halter malliot (hot pink) with sheer pale blue/greeen kaftan top and haviannas for afternoon beach. Alex Perry cateye shades for all three. Oh Lou Lou you have it sorted. I bow down to your Outfit Planning! Well, as I feel the heat horribly, I will wear a bright and colourful kaftan dress in soft cotton. I won’t wear jewellery because the sweat makes it stick to my skin – ick – and I’ll have bare feet because we’re staying at home! But my hair always has to be perfect – I’ve bought colourful clips to clip the sides up (I have a one-length bob similar to yours). Super casual and super comfy – yay! Sounds perfect Petra … hate that icky, sticky feeling! I recently bought these Witchery pants, at your suggestion, for the printed pants- not what I would usually buy, though I love them, so comfy and cool and I plan to wear them with a white tank for Xmas day- plenty of room for Xmas dinner with the elastic waist band!! Oh, so glad you love them and yes, if there has to be a waist band on Christmas Day may it be generous with its elastic! Go JoJo … and yes I would do a slip if it’s sheer. Re the earrings … I prefer to bling it up with my nice accessories. Plenty of time to do a funny aunt routine in the future! I Love the white dress Nikki, i have 3 dresses to decide from one is a watercolour maxi dress with splits in the hem so should be cool,my Camilla which is loose and flowy and I haven’t worn yet,but might to hubbys Christmas party this weekend on the Harbour cruise? I have a maxi one and a silk coral and white maxi dress,but i haven’t decided which one I will be wearing.Our Christmas is pretty casual but i like to look nice!We go to My parents for lunch this year and then to my Sister in Laws for dinner so i always need a comfortable chic dress that is cool and that can hide a food baby,though I do try not to eat too much at the first place or I can’t fit in the next meal.We take it in turns with each family one year lunch ,one year dinner. The big question is what will you be wearing Nikki! You must wear the Camilla this weekend Lisa … perfect for a harbour cruise!! Me, I hope to be in my swimsuit with a coverup over the top … keeping it very casual this year. I love that white dress, gorgeous and goes perfectly with fox-in-flats ‘white’ style date for Christmas Day! I have 3 chrism as pool parties to go to over Christmas and Boxing Day so will definitely be going for something casual and easy. Yes, it would be perfect for Foxy’s Christmas Day dare! And yes, you need something you can easily and stylishly pop over the top of a swimsuit for those two days. Hi Lucy, yes you would get it by Christmas. Verily is located on the Sunshine Coast. I’ve found the sizing runs true. I would be a 14 in that dress (am a 14 up top and 16 bottoms). Leonie, the designer, is always happy to answer your emails or phone calls before you buy. Love em all, as usual. I am thinking of going the flowy maxi dress option. Maximum room for full post lunch stomach! I’m very much of the same opinion!